Worship music • The landmark 1985 volume sets the tone for services in LDS chapels worldwide. Lennie Mahler | The Salt Lake Tribune A book of LDS hymns lies on a pew at the Manti Tabernacle. Bonnie Goodliffe remembers vividly the day the 1985 edition of the LDS hymnbook went on sale. Goodliffe, a Tabernacle organist who served on the committee that compiled the hymnal, watched through tears as people lined up waiting for truckloads of the books to be unloaded at Brigham Young University&apos;s Wilkinson Center. "I was thinking, &apos;We did our very best; I hope we got it right,&apos; " she recalled 30 years later. Though many Mormons of a certain generation still think of the green-bound volume as "the new hymnbook," it has been a fixture in meetinghouse pews for so long, Goodliffe said, that "some people hardly believe you when you tell them that &apos;Because I Have Been Given Much,&apos; &apos;Hark, All Ye Nations!&apos; or even &apos;I Am a Child of God&apos; haven&apos;t always been there." 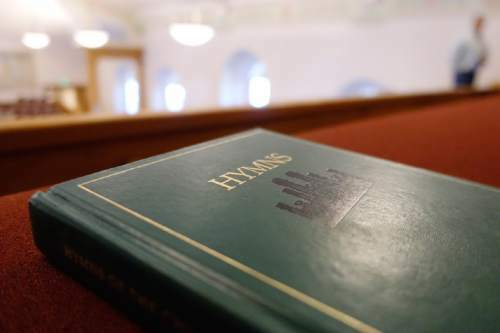 The 1985 volume  official title: "Hymns of The Church of Jesus Christ of Latter-day Saints"  was a landmark in the LDS Church&apos;s history of hymnody, fellow committee member Marvin Gardner said. "We were told to create a template" on which subsequent editions in different languages could be based, Gardner said. "It helps unify the church throughout the world in a way no hymnbook had done before. ... It also unifies us among generations and within congregations." Latter-day Saints across the globe used a succession of compilations, authorized or otherwise, in the years since Emma Smith, wife of Mormon founder Joseph Smith, published the faith&apos;s first official collection of 90 hymn texts in 1835. "The line between &apos;official&apos; and &apos;unofficial&apos; hymnbooks was sometimes a vague one," committee member Karen Lynn Davidson wrote in her 1988 companion volume, "Our Latter-day Hymns: The Stories and the Messages." Not until 1985 was there a standardized resource for members all over the world. For English speakers, "Hymns: The Church of Jesus Christ of Latter-day Saints," popularly known as "the blue hymnbook," enjoyed the longest reign as the church&apos;s official hymnal. It was published in 1948 and revised in 1950. Michael Moody was appointed to oversee a new edition in 1983, building on groundwork laid in the 1970s. His committee re-evaluated the contents of the existing book and combed through more than 6,000 new submissions. The panel field-tested around 200 finalists among diverse groups of Mormons; some personal favorites got the ax based on this feedback. "We had a very clear understanding of what our role was," Moody said. The new book was to serve a worldwide community of Latter-day Saints. Foremost, it was to be a source of spiritual nourishment, he said, "not a museum piece for the artistically inclined." Most of the hymnal stayed the same, albeit organized more consistently by theme. Ninety-two hymns were added  44 new selections written by Mormons, 14 comebacks from pre-1948 editions, 15 from other faith traditions and 19 with new tunes or texts. Sixty-five hymns and a handful of alternative hymn arrangements were dropped to make room. The most famous deletion was "Come, Thou Fount of Every Blessing," which committee members suspect would still be little-remembered among Mormons had not Mack Wilberg published his celebrated arrangement just a couple of months later. Some of the newcomers, such as "Where Can I Turn for Peace?" and "I Believe in Christ," have become favorites. Others that committee members were certain would become hits, such as "Behold the Mountain of the Lord," haven&apos;t caught on. Goodliffe said she anticipated some micromanagement from LDS authorities but can remember only one explicit instruction. Then-apostle Boyd K. Packer was adamant that the lines "Only he who does something is worthy to live/The world has no use for a drone" be excised from the hymn "Have I Done Any Good?" Gardner came up with the replacement lines: "Only he who does something helps others to live/To God each good work will be known." "I was very happy about that," Goodliffe said. "I was always somewhat uncomfortable [with the original text], to put it mildly." Though many of the hymns popular in Mormonism&apos;s early years were retained for their historical significance, committee members pruned several of the more esoteric and Utah-centric selections. "We had a lot of general exhortative hymns," Goodliffe said. "We needed more hymns about sisterhood, missionary work, fasting and families." They also added a handful of children&apos;s hymns because, as Gardner noted, youngsters attend the main LDS worship service, too. Many hymns were transposed into keys that were easier to play and sing. The 1985 edition also differed from its predecessors in its inclusion of scriptural references with each hymn. Committee member Vanja Watkins remembered the Scripture-matching process, made considerably easier by the church&apos;s publication of a topical guide just a few years earlier, as a particularly rewarding one. "We had a holy feeling come over us," she said. Another feature introduced in 1985 was the extensive index section. "We were eager to make it as usable as possible," Gardner said. Readers can search for hymns by topic, tune name, meter (the number of syllables in each phrase), author and composer as well as by title and first line. There also are tips for beginner music directors and accompanists. The book is available in 31 languages, with a half-dozen more in production, said Diane Bastian, the church&apos;s music manager. There are 104 core hymns included in each edition and an additional 50 that are "strongly recommended," Bastian said. That leaves room for up to 50 hymns specific to the language and culture of the church members who will sing from the book. For example, the Italian-language edition includes the chorus of the Hebrew slaves from the Verdi opera "Nabucco." That&apos;s one reason that, notwithstanding rumors to the contrary, there won&apos;t be a new edition in the foreseeable future, Bastian said. While English-speaking Mormons are marking their hymnbook&apos;s anniversary, she said, "some [language editions] don&apos;t even have a birthday."